The Printed Complete Dictionary a Dinosaur? Could it be true? Is the paper dictionary a dinosaur? Here’s some interesting dictionary facts and you can decide. The current Dictionary full Volume is 20 books, and weighs 137lbs. All this came up because the publishers of the Oxford English Dictionary have announced that the 3rd Edition may never actually be printed. The 3rd edition is still only 28% finished (sheesh!) and by the time it’s completed, paper printing on major volumes such as this will never make economic sense. They also confirm the ONLINE Dictionary is viewed 2 million times a month. 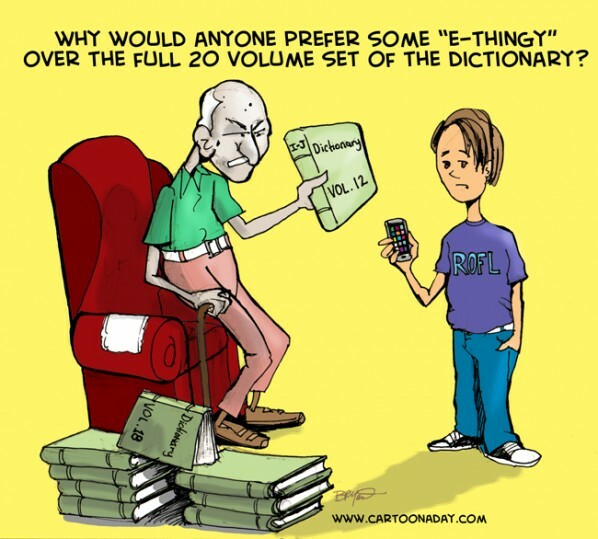 A funny cartoon about the digital vs paper printed dictionary. An old timer talks to a young person.